The quaint Dutch Caribbean island, just off the coast of Venezuela offers something for everyone, whether you are looking for a vibrant nightlife, lounging on one of the world’s top 10 beaches, delicious international cuisine or the thought of 365 days of sunshine during your Aruba honeymoon. For couples who don’t want to stray too far from the East Coast but crave the warm, romantic luster of the sea, Aruba is dreamy option. This small Dutch-Caribbean gem is off the coast of Venezuela and offers everything from pristine beaches to hiking trails and even historical ruins. It’s most well-known for their divi-divi trees that have a natural slope to them, thanks to trade winds, and for the touches of Europe that are found throughout the nation. You’ll hear Dutch, Spanish, English—and a dialect that’s a mix of all three, as well as the local language, Papiamento, as you get lost in the culture and the sunshine. Though Aruba has battled to change its reputation following a very public murder case, the area is considered generally safe, especially in tourist regions. The local people are warm and kind, and often more than excited to offer all of the reasons why Aruba is worth visiting—no matter what the bad press says. Here, a guide to your romantic Aruba honeymoon. More and more couples are going against tradition and booking their honeymoons for when it is budget-friendly—and not necessarily right after they said ‘I do.’ To save money, avoid taking off to Aruba from January to March during their peak season, when rates at many hotels and resorts are at their tip-top price. Instead, go from April to August when the prices are much lower… and the heat is high. Though it’ll be balmy and definitely a bit sweaty, with an air-conditioned room to retreat to, you’ll be just fine. Visit Palm Beach: Though Eagle beach gets most of the attention, a little lesser-known, two-mile stretch of sand not too far away is Palm Beach. With fewer crowds to fight, you can savor the blue sea, the coral gardens and the palm trees, without interruption. Explore Oranjestad: If you didn’t know, Aruba was occupied by the European influences in the 19th century, and today, the remains of this period of time are found in the hills of Oranjestad. Built in 1870 by the British, you can tour through old buildings and learn about pirates, crusades and more. Pet donkeys: Yep, you read that correctly: donkeys are native to Aruba, and in an effort to keep them healthy, a sanctuary opened and invited tourists. You can meet them, feed them, walk with them… and even cuddle, if you feel inclined. Go hiking in Arikok National Park: You can’t have an Aruba honeymoon and miss this area that encompasses 20 percent of the country. You’ll be amazed by the endless wonder—from 360-degree views to trails that take you past abandoned farmhouses and remarkable, colorful flora. Go swimming in Boca Catalina: For couples who seek privacy, make your way to the western coast of Aruba where you can escape to a tiny natural pool between sand and boulders. You’ll need to find it between Malmok and Noord beach, but once you’re there—you’ll want to steal a smooch of three. It’s best for watching the sunset while wading in the water. Experience Guadirikiri Cave: You might not be able to say the name three times fast, but one of the greatest draws of the Arikok National Park is this cavern. Connected through the—appropriately named—Tunnel of Love, you can see Arawak Indian cave paintings that are lit by a natural skylight, and more. Have fun in San Nicholas: A bit off the beaten past, more and more travelers are trekking to this region to experience local culture. Here, you can see street murals, purchases artisan crafts and even take a dip in Baby Beach nearby. 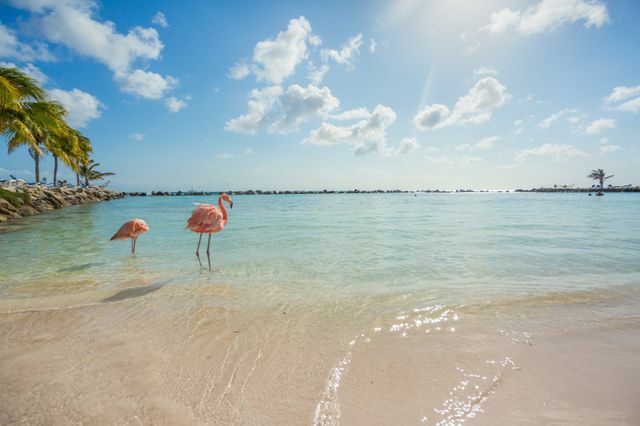 Hang out with flamingos…and iguanas: When you’re in the central capital of Aruba—Oranjestad—consider staying at the The Renaissance Aruba Resort which features it’s own private island. Here, you will find flamingos and iguanas roaming wild… and often looking for a snack. Go ATVing: Because of the landscape of Aruba, many thrill-seeking couples love pushing the pedal to the metal with a 4X$ tour. You’ll need to wear goggles and helmets, but it’ll be a fun start to the adventure of marriage. Spend the day at sea: Thanks for water so clear you can sea-through it—get it?—a catamaran day is a must for honeymoon duos. You can snorkel, lay in the sun, sip on champagne and eat fresh seafood, all for an affordable price.